Around Reykjavík there are a group of must see sights. The tour busses do them in a day or two, we have taken five. 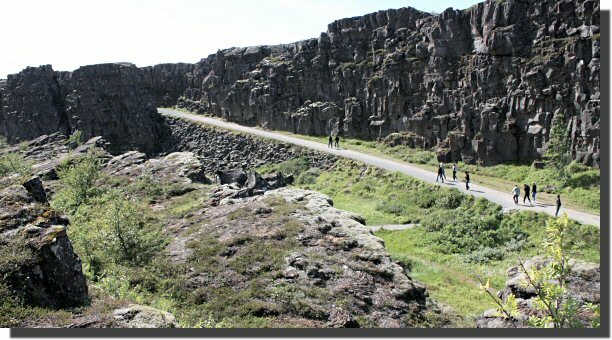 In geological terms Þingvellir is the area around the spectacular rift between the European and North American tectonic plates. In cultural and historical terms Þingvellir is the most important site in Iceland, the place where the world's first parliament (Alþing) was held in 930 CE, where the entire Icelandic law was recited each year by the lögsögumaður and where the formal establishment of the Republic of Iceland took place in June 1944. Geysir is the name of a specific spouting hot spring that alas no longer spouts regularly (since an earthquake in June 2000). 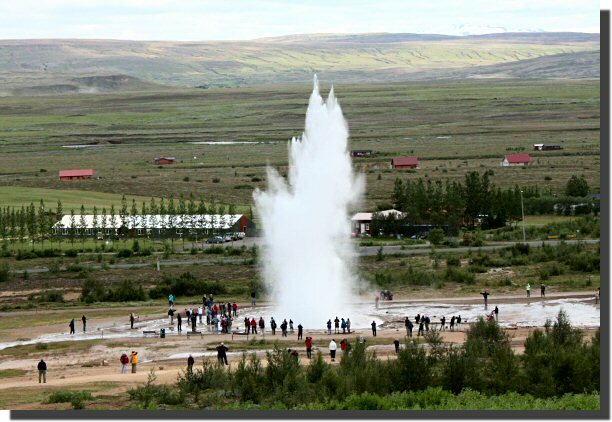 Luckily Geysir's neighbor, Strokkur, preforms on cue every three to six minutes. Until recently Geysir had been encouraged to perform by pouring detergent into it but this is no longer considered ecologically sound. The hot run-off water from Strokkur feeds the hot tubs at the back of the Geysir Hotel. 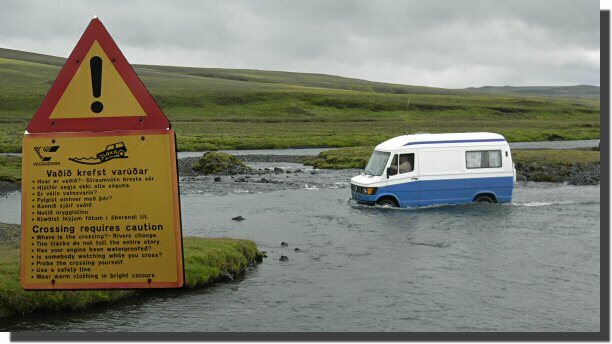 If you stay in the camp site you can not only use the hotel's hot tubs you can also enjoy Strokkur, all to yourself, at midnight. 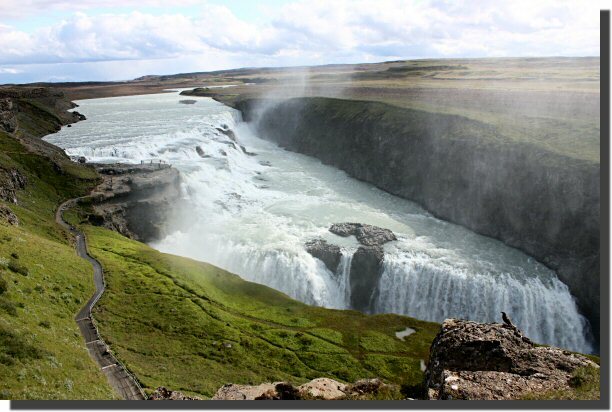 Gullfoss is Iceland's most famous waterfall (conveniently situated near Geysir). Get there before 10:00 (and the tour busses). Landmannalaugar is a rather beautiful place, with a fine camp site and a popular natural hot tub. Officially it is only accessible by 4x4 vehicle or a very long walk! Though lots of non-4x4 vehicles get there without (much) problem. A sign seen on an Icelandic 4x4 at Landmannalaugar. Home - This page last changed on 2009-07-27.